While the company offered cautious guidance, investors on StockTwits were still impressed with how strong sales have been. The luxury business has been booming recently, particularly in overseas markets. Tiffany's (TIF) reported strong results Tuesday, helped by robust demand for jewelry in Japan. Coach (COH) said last month that global sales were up in the first quarter, thanks to a 40% rise in China. Some traders said the stock was held back Wednesday by losses in the broader market. 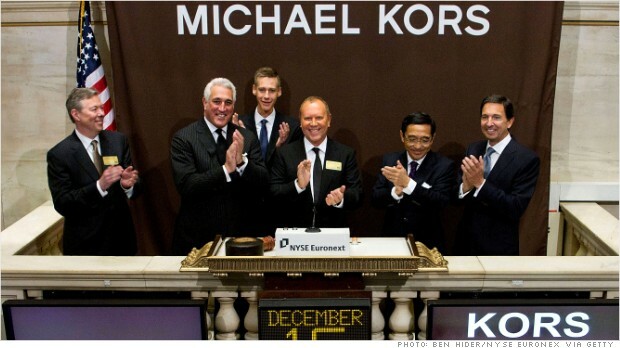 Michael Kors shares have surged 130% since the Hong Kong-based company went public in 2011. $KORS just picked a bad day to report earnings. If the market recovers, could pop tomorrow. $KORS Nothing's changed. BEST retail name to own. Broad markets will do what it needs to do. Upside potential of this gem remains intact. The company's founder and namesake is perhaps best known as a former judge on reality fashion show Project Runway. But the brand seems to resonate with consumers who aspire to the finer things in life, like private jets. The company's management mentioned the phrase jet-set at least eight times during a conference call on Wednesday, notes one trader. That's in contrast to Coach, another maker of high-end leather goods, which is more yacht-set than jet-set. But isn't all this talk about the jet-set kind of annoying? So $KORS is the cool new brand in a niche Coach never exploited. Trouble is one day that one-dimensional 'jetset' message will become tired.